I closed my 2017 review of the MOOC space with the following line: “Who knows, 2017 could just have been the year MOOCs became big business.” Now, only a few months into 2018, I can’t believe I expressed any uncertainty about the business of MOOCs. If there was any doubt before, there isn’t much now: MOOCs are indeed big business. In Feb of this year, Udacity made a stunning announcement – the company’s revenues touched $70M in 2017, up from $29M in 2016. Udacity is a global company with over 400 employees and operations in seven countries. In Class Central’s 2017 Year in Review for Coursera, we estimated that the company is now within striking distance of $100 million dollars in annual revenue (if they haven’t already crossed it). Coursera’s corporate learning efforts are also finally paying off. The company now has 1000+ corporate partners, up from 500 at the end of last year (and from 30 the year before that). With stable and growing consumer revenues, the big MOOC providers are increasingly looking upstream at higher ticket items, specifically online degrees, and corporate learning solutions. These are the top two tiers of the six-tier monetization model Class Central developed as part of our 2017 year-end analysis of the MOOC space. 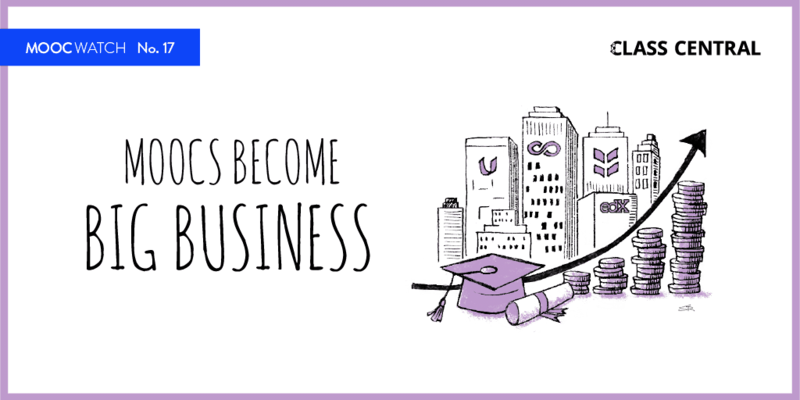 Both the online degree and the corporate learning markets already have a lot of existing players, but MOOC providers have a unique competitive advantage. In the online degree space, MOOC providers have a significantly lower cost of user acquisition as compared to the traditional players. In other words, MOOCs make a fantastic marketing channel. 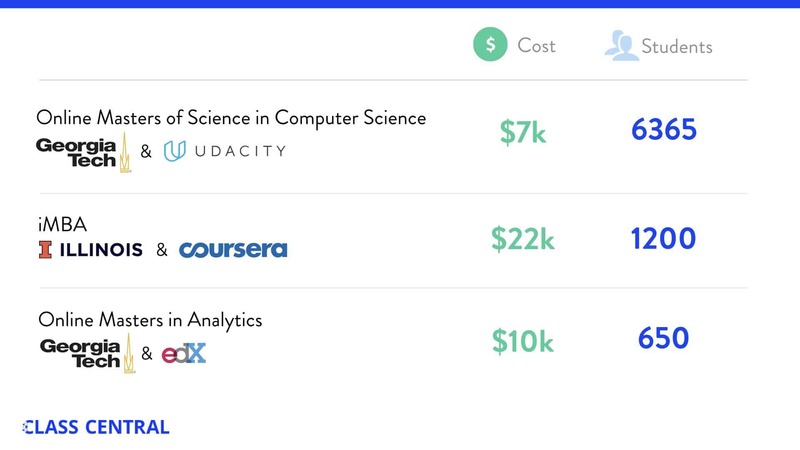 At their recent conference, Coursera announced $9.6M in tuition from their online degrees. 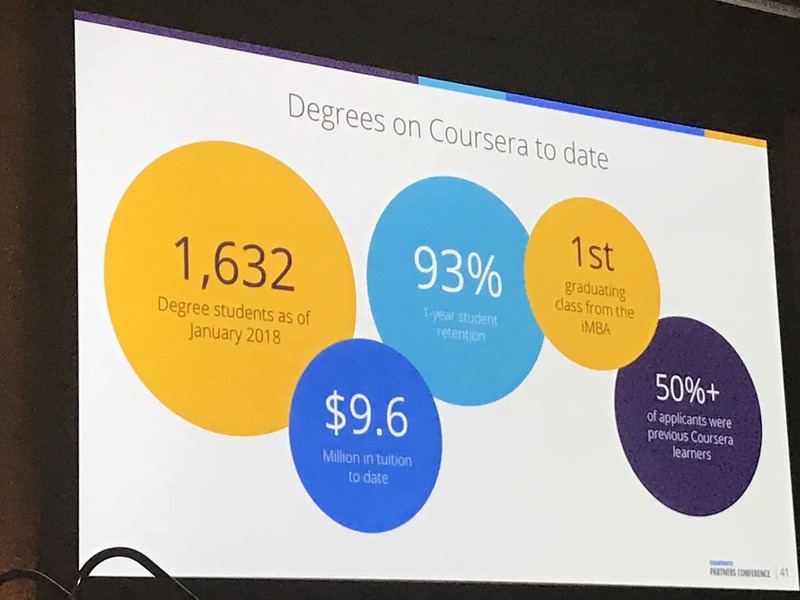 With numbers like this one, it’s no surprise that Coursera has plunged further into the online degree space, announcing six new online degrees, including the first MOOC-based Bachelor’s Degree. Recently, FutureLearn also announced new partners who are planning to launch online degrees. My own back of the envelope calculation shows that the potential revenue from the top three online degrees is more $80M dollars. On the corporate learning side, content provided by well-known universities helps MOOC providers stand out when compared to other online course providers. Now, with more and more MOOCs serving as course content for bona fide degree programs, this learning technology is gaining credibility in both the consumer and the corporate markets. If you like MOOCWatch, I would also recommend subscribing to FutureLearn’s Chris Fellingham’s Human Learning newsletter or Sophie Bailey’s The Edtech Podcast. Udacity’s revenues reached $70M in 2017, up from $29M in 2016. Revenue grew across the board in “consumer, business, government and non-profit customers and partners,” according to Udacity CFO Nikhil Abraham. At their annual Intersect conference, the company also announced a School of AI, Udacity Universe, and a Robot Learning Lab. Coursera announced six new degrees from five different university partners. Perhaps most surprisingly, The University of London announced it will offer a B.S. in Computer Science through Coursera. 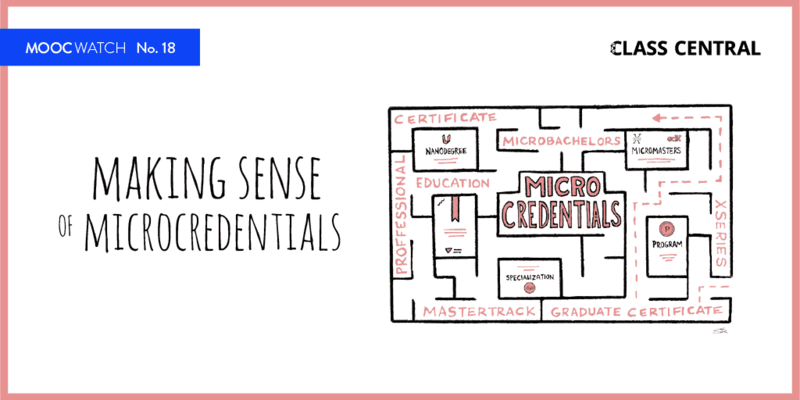 Coursera also announced a new credential called MastersTrack, which is similar to edX’s MicroMasters. These announcements were made at Coursera’s Partners Conference at ASU. Here are some takeaways from the conference, compiled by Chris Martin. The results are in! In 2015, Class Central first published a ranking of the best online courses of the year based on reviews from our users. We did it again in 2016. Now we are back with a list of the best online courses of 2017. The 2018 Open edX conference will be held at in Montreal, Canada from May 29th – May 31st. Class Central is a media partner and we will be present at the conference. A master’s degree in electrical engineering from the Boulder campus was approved by the University of Colorado Board of Regents. Interestingly, students will not need to submit a formal application process to enter this degree program, nor do they need to possess an undergraduate degree. TU Delft’s Virtual Exchange program allows students to earn academic credit for MOOCs from their own university and of 8 other top universities in the world. Approximately 100 students participated and received a final grade in the global virtual exchange. MIT, Boeing, and NASA have partnered to develop a set of four professional development training courses. This example shows how the MOOC model might be used to upskill workers at scale, while generating impressive revenues. Forty students who completed the Supply Chain Management MicroMasters from MIT on edX arrived on campus to begin their first semester at MIT. edX won a $700,000 grant from the Lumina Foundation to support the MicroBachelors effort with the organization’s university partners. A list of 1150+ Coursera courses that are still completely free (minus the certificate). EdX is working on a deal with the Indian government that will make its courses available on India’s official MOOC platform, SWAYAM. 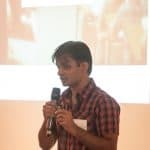 Interview of Class Central founder Dhawal Shah. A deeper insight into the education industry beyond MOOCs, by Chris Fellingham. 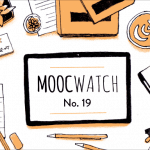 Meet the independent MOOC whose performance rivals the big platforms. The University of Tasmania’s Dementia MOOC has been taken by 120,000 people, of whom 48,000 went on to earn a certificate. The course is one of the highest rated on Class Central. Rice University and 10 other institutions in Europe, Asia, and Australia have agreed to be part of a three-year “Credits for MOOCs” program that allows students from the participating schools to enroll in specific free online courses from the other member schools and receive transfer credits for passing them. A similar program already has been implemented by Delft University of Technology. Yes, there are even MOOCs that can teach you parenting skills. We found no less than17 online courses on subjects ranging from nutrition during pregnancy to teaching your child to read to helping your child to cope with divorce. FutureLearn announced two new partners who will offer online degrees through its platform – Murdoch University and Open University (which owns FutureLearn). The University of Queensland’s UQx Massive Open Online Course program has reached two million enrollments. Some 32% of full-time data scientists started learning machine learning or data science through a MOOC, according to a survey from data scientist community Kaggle. Latin America’s largest MOOC platform offers over 300 courses from 90 university partners. To date, these courses have received more than four million enrollments. Coursera experimented with a single subscription price for the entire catalog. For $49/month learners could get full access to Coursera’s entire catalog. Unfortunately, the experiment is over and Coursera is no longer offering this option to learners. You are always on spot with the industry.